Black flies are not very common in most of Iowa, though a few samples and calls are received every year. Some years, however, we experience a marked increase in the number of calls about "those ! @#$%* gnats that bite like @#$!%*!". 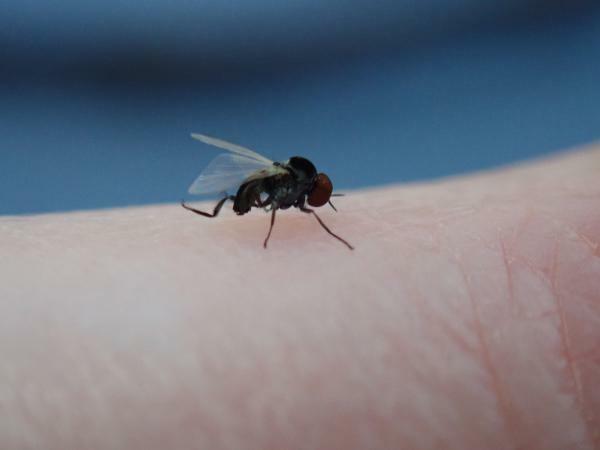 Black flies, also known as buffalo gnats and turkey gnats, are small, bloodsucking insects slightly less than 1/4 inch long with a stout-body and hump-backed appearance. They are most common along rivers and streams during late spring and early summer. Only the female black flies are bloodsuckers. Their bite is extremely painful, and the injection of a venom into the skin causes intense itching, local swelling and soreness. All exposed parts of the body are subject to attack, tough they favor the head, just beneath the hat rim. Severe complications (swelling) from black fly bites are possible in allergic individuals and rare cases of death from toxemia or anaphylactic shock have been reported. In the United States, black flies are not known to transmit diseases to humans. Livestock, pets, poultry and wildlife are also severely irritated by these flies and can die from anaphylactic shock to the bites. Be sure to check animals during black fly outbreaks. Keeping animals indoors, treatments with insecticides, and fans to keep air moving are all ways to help protect livestock and poultry. Black flies live as larvae in shallow, clear, fast-running water in rivers and streams. The black, spindle-shaped larvae live on the river bottom attached to rocks and other submerged objects and feed on tiny bits of organic matter, algae and protozoa. Larvae transform in the water to adult flies that rise to the water surface in a bubble of gas. The adult flies are usually present for about 3 weeks before they die. Eliminating black flies is not practical. Treating breeding sites (rivers) would be difficult if not impossible. Fogging for adult control, as a municipality might do against mosquitoes, is a possibility, though past experiences have shown limited success because of the continuous emergence of new adults and the long distance movements of flies. Frequently check livestock and poultry during black fly outbreaks and if possible keep animals indoors (especially at dawn and dusk when flies feed the most). Treatments with insecticides are available and you should consult with your veterinarian about options, and finally, if feasible you can use fans to keep air moving as black flies do not like wind. Do you live in Iowa and have an insect you would like identified? The Iowa State University Plant & Insect Diagnostic Clinic will identify your insect, provide information on what it eats, life cycle, and if it is a pest the best ways to manage them. Please see our website for current forms, fees, and instructions on preserving and mailing insects. Contact information for each states diagnostic laboratory for U.S. residents. If you live outside of Iowa please do not submit a sample without contacting the Plant & Insect Diagnostic Clinic.